Green ICT systems provide the technological basis for organizations to adopt and implement Green ICT policies and practices. This system support can be enhanced by using the upcoming emerging technologies of Cloud computing, Web 2.0, Service Oriented Architecture and Mobile technologies. This chapter aims to incorporate these emerging technologies within Green ICT systems to help organizations be environmentally responsible. Green ICT can be considered as the adoption of an eco-friendly process by an organization in its practice of Information and Communication Technologies. The last decade, in particular, has seen profound awareness on the part of individuals as well as organizations in being environmentally aware. While automation and related computing activities continue to lead to exponential use of energy quotient, at the same time, Green ICT continues to chip away at the ‘resigned‘ views of the decision makers to environmental responsibilities. ICT operates at systems level, applications level, at the end-user level through the desktops and printers, and at the enterprise level through its data centers, servers and other infrastructure. Green ICT is all about optimization and improvement of the organizational processes without hindering its progress in the use of technology and simultaneously minimizing the organizational impact on the environment . This chapter will discuss the context provided by ICT in introducing an organization to a Green ICT system and explaining a detailed architecture and design of such a system. The issues discussed include Hardware and Software implementations, infrastructures and attitudes and policies of decision makers and how they influence global warming, including carbon emissions and the use of software applications in measuring and reporting carbon emissions. Today, emerging technologies such as Cloud Computing, Software Oriented Architecture (SOA), Software as a Service and mobile technologies are bringing the most cutting-edge innovative solutions and developments in the field of technology to fruition the business. These emerging technologies have seeped into the business processes of organizations. Such converging technologies have helped organizations attain competitive advantage by its innovative concepts that bring about developments within the field of business. These technologies have a substantial potential, by virtue of their incorporation within businesses to provide long term sustainability as well as creating positive impact on the environment. More than the cause of climate change; businesses are interested in investigating appropriate measures to handle the effects and most importantly, resolving their causes. This chapter investigates the architectural and design aspects of emerging technologies that can be used to ameliorate the effect of business activities on the environment. Thus, the discussion involves various emerging information and communication technologies (ICT) from a relatively more technical view point, but keeping its value to business, firmly in mind. The chapter involves a sustainable implementation of a Green ICT system within organizations to increase operational efficiency and promote use of best practices. The range of systems that are technologically advanced and that can help the organizations increase their green performance can be termed as “Green ICT Systems”. Green ICT systems provide the technological basis for organizations to adopt and implement Green ICT policies and practices. For example, with the help of Green ICT systems, an organization can accurately collect data on its carbon emissions, analyze it and report it to the regulatory bodies. The regulatory bodies help organizations access/evaluate its process efficiency ensuring the practice of optimal usage of competent technology and its consistent compliance. Such systems increase their potential multi-fold when we incorporate emerging green technologies such as Cloud Computing, Web 2.0, Services Oriented Architecture and Mobile technologies. The discussion as undertaken in this chapter, explores how Green ICT systems can benefit through the aforementioned advances, e.g. improving the accuracy or speed of response to changes in environmental data. While ICT activities themselves contribute to increased carbon emission in businesses, it is vital to note the opportunities that ICT systems can provide in the greening of an organization. ICT systems support end users, decision makers, customers and other users within and outside the periphery of the organization. Green ICT systems can not only help with collection and disbursement of data, but also help improve organizational processes without hindering the progress of organization in use of technology. 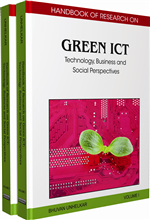 This chapter discusses the incorporation of emerging technologies with Green ICT systems – particularly the various stakeholders in terms of improving the green credentials of the organization. Green ICT systems can provide support to implement policies of decision makers, calculations and reporting of carbon emissions and maintain the ability of the organization to continue its business operations with minimal effect on the environment. Business Process Improvements (BPI): Is an approach in which optimizes underlying processes to gain efficiency and aligns business goals. Software as a Service (SaaS): Is a concept where the software is provided as a service which is licensed by the provider. Platform as a Service (PaaS): Is a provision platform for software development present in the cloud. It provides facilities and supports the web developing life cycle providing it as a service over the internet. Software Oriented Architecture (SOA): Is a set of protocols used for the process of system development and integration that provides end users services that can be used within multiple domains. Cloud Computing: Is a concept in which dynamically scalable and virtualized resources are provided as a service over the internet which is also known as the cloud.